23 VAN DER AA, P. / OLEARIUS, A. Cassimogorod ville de la Tartarie Moscovite. Leiden, 1719-1727. Bel exemplaire. P�le mouillure en bas du pli central. - Good condition. A water stain in upper margin just affecting the engraved area. 270 x 339 mm. 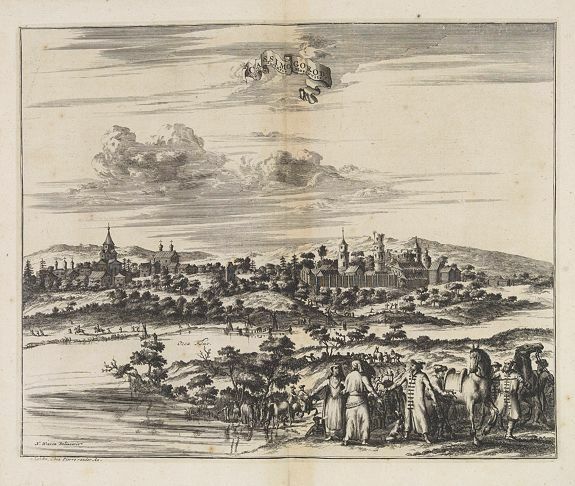 � Vue de la ville de Kasimov sur la rivi�re Oka � l'est de Moscou. Publi�e par Pieter van der Aa, � Leyde dans "Voyages tres-curieux et tres-renommez faits en Moscovie, Tartarie et Perse." Decorative view of the town of Kasimov on the Oka River, east from Moscow and south from Murom near the northern shore of the Caspian Sea. The city is seen from across the river Occa. 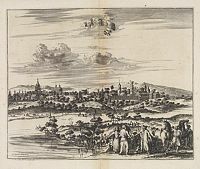 This well executed engraving was published in 1719 and 1727 by Pieter van der AA, in Leiden in "Voyages tres-curieux et tres-renommez faits en Moscovie, Tartarie et Perse." Adam Olearius (24 September 1599 � February 22, 1671), born Adam �lschl�ger, was a German scholar, mathematician, geographer and librarian. He became secretary to the ambassador sent by Frederick III, Duke of Holstein-Gottorp. Employed as secretary to an embassy sent by the small German state of Holstein to explore an overland trade route with Persia. The first embassy was dispatched to Russia in 1633-34 to secure the tsar's permission to travel and ship through his realm. The second was sent in 1635 to complete the deal with the king (shah) of Persia. Although the commercial mission failed miserably, the embassy was successful in the incredible amount of information gathered by Olearius. After returning to Holstein in 1639, Olearius continued in the Duke's service and published the first edition of his travels in 1647. In 1656 he released a second, enlarged edition which became very popular throughout Europe and within a few years was translated into Dutch, French, Italian and English. Read more about Olearius at the site of University of Washington - Hollstein LIII 1999, 201. Van der Krogt KAN IVA, 44:47. v.d.Krogt, Maps in books of Russia and Poland, 14:060.